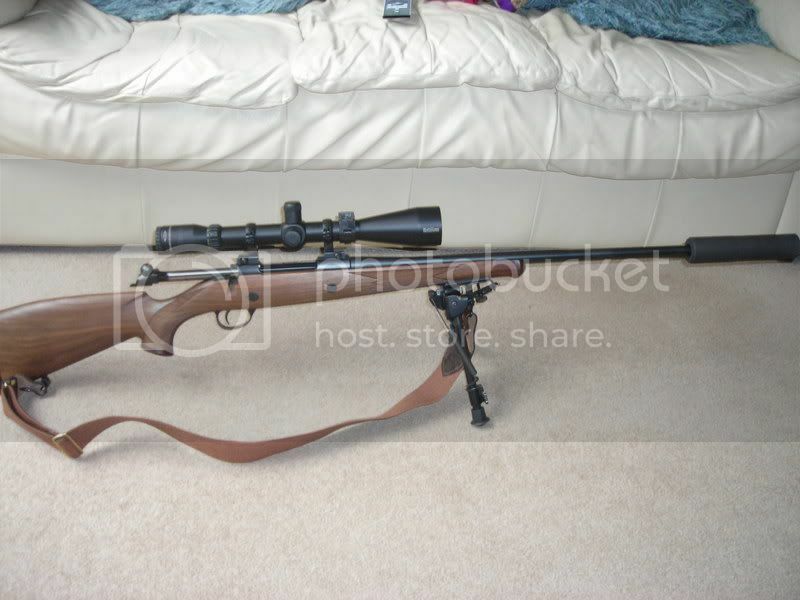 hi i have a sako 75 at the momment and have realy enjoyed using it, i am now getting another cal and was going back for another sako but what was wandering if the new 85 was realy worth the extra cash i have read the some articals about the 85 safty mag systm . Taking it you live in the Shropshire area so have you tried Morgans of Oswestry (ask for the gun room), last time I popped in they had a number of very competitevely priced 75 and 85's on offer along with some nice t3's. Another place in Shropshire is the bog at Minsterly or a little further a filed is the shop in Wensbury west mid or Valley arms at Ruthin across the border in North Wales. The sauer is smooth and silent like me it is black like me , with a nice fluted barrel . It has the best mounting system on a rifle with a built in weaver rail. Deadly accurate out of the box has a set trigger leaving at a nice crisp 1lb . Its is a couple of pounds lighter than the sako, I paid 1100 from new with rings ready to shoot. Did i say you can take it apart and change barrels for other calibres . Morgans will order you what you want but hadn't got many cf rifles in last week when i called in. they ordered a ouple of Beneli's for my mate on a sale or return basis and they were in within a week he bought the one he wanted and they sent the other back. In contrast he went to the bog first and paid up front, waited 3 weeks to be told it would take up to another month. NB Cambers on the cressage road have a few rifles in and will order you anything you want. the owner is a keen stalker. Wynstay farmers in oswestry have just opened a new gunroom so might be good for a deal. Garlands at stafford have a fair bit of kit and is deffinately worth a phone call. Actually while we are on the subject, any of you know a gunshop relativly local to shrewsbury that carries a stock of reloading components? I have the wood laminate in stainless with a Jet-Z mod, I recommend you pop into a local shop and pick one up to try. I was going for a T3 untill I picked up the 85, lifelong purchase so worth the extra. I have a sako 75 and an 85 I'm very pleased with them both, don't be put off the magazine release on the 85 not a problem as far as I can see and more difficult to loose the mag by accident. I've had the mag on the 75 drop out once and was lucky to find it. I had the 85 on order with GMK for 3 months but it was worth the wait and every penny. model 85 were you going to buy ?. I have 2 Sako 75s, one in 243 and one in 7.08, the 243 has a blue action in a Sako synthetic stock , and the 7.08 is stainless in a synthetic stock,last year I decided to replace my fathfull 75, 243 with a new 85, 243. After a few phone calls, my local gunshop managed to get me, yes you guessed it a new 75, in 243. What I would say is look before you buy, I wished I had it would have saved me a lot of time and money. i used to own a Rem SPS and after feeding and watering the money tree in the back garden all year i managed to get enough to part ex it for a Sako 85 synthetic varmint stainless with fluted barrel in the girly .243 .